Even the most boring reports can use a bit of bling. 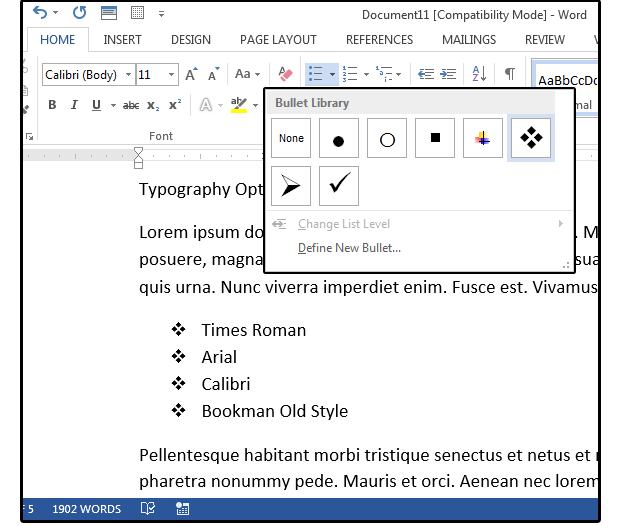 Word’s bullet point function is essential for breaking up vast piles of text, especially if you can’t use graphics or photos in your documents. Word’s standard list of bullets will cover many situations, but making custom bullet points can add polish or humor to your content. Once the document is complete, experiment with different bullet designs. 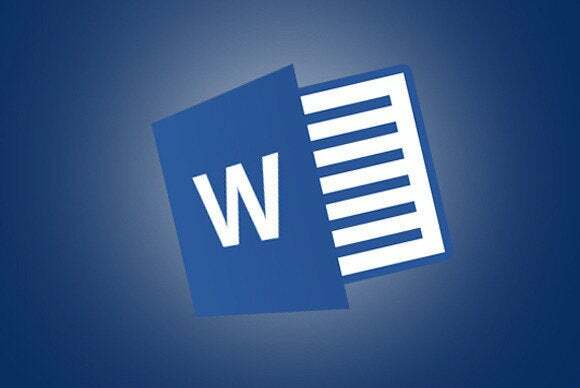 We’ll start with Word’s default bullets to introduce the process. 1. Select the content for which you wish to insert bullet points. 2. Go to Home > Paragraph. Locate the bullet icon at top left and click the down-arrow at the right side of that icon. Note: If you hit the icon itself, a bullet will appear wherever your cursor is in your document. 3. From the Bullet Library menu, choose a bullet design, and the new bullet design will appear at your cursor location. If you don't like the first bullet you choose, click the Undo icon and try another one. Note: Word remembers the last six (or so) bullets used, so after you define a bullet the first time, it appears on the new list. Creating custom bullets can add some creativity or branding to your content, such as clocks for timesheets, books for reports, or computers for data logs. 1. Highlight the content to which you want to add bullets. 2. Go to Home > Paragraph and select the down-arrow next to the bullet icon. 3. From the Bullet Library menu, scroll down to the bottom, then click the Define New Bullet button. 4. In the Define New Bullet dialog, click the Symbol... button. 5. When the Symbol dialog box opens, notice the font. Word remembers the last font used, and that font shows onscreen. 6. If it’s a text-only font, click the down arrow next to the Font field box. Scroll through the list of fonts and choose one of the Bullet fonts, such as Wingdings, Wingdings 2, Wingdings 3, or Webdings. 7. The selected font fills the boxes in the window with interesting, graphical bullets. Scroll through the list and choose a bullet design. 9. Click the bullet, then click OK, and OK again. 10. Repeat steps 1, 2, and 3 from the Default Bullets section above to change the remaining bullets in this section. Note: When you select Symbol from the Define New Bullets menu option, your bullet design options are based on the fonts you have installed. 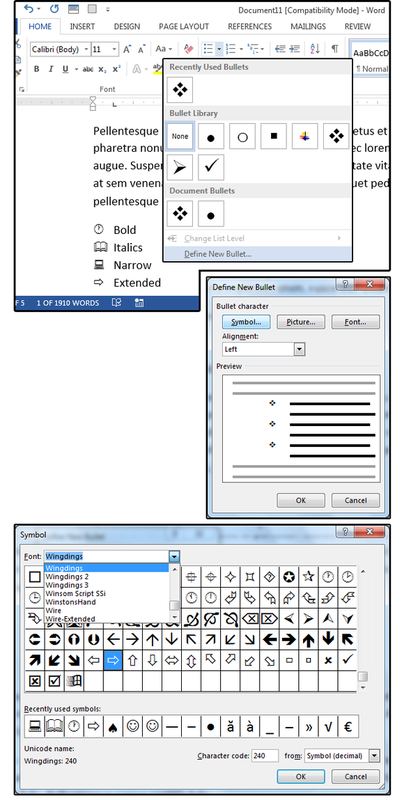 Microsoft Word has a few bullet typefaces, and some versions include Wingdings. If you don’t have an acceptable bullet font installed, Google “Bullet Fonts” to find an untold number of free bullet fonts. Select an appropriate site, review the available fonts, then download to your computer. Fonts are installed through Windows (not Word). Once the bullet font is installed, right-click the font, then choose Install from the popup menu. If it doesn’t show up in Word, close the program, then restart it. 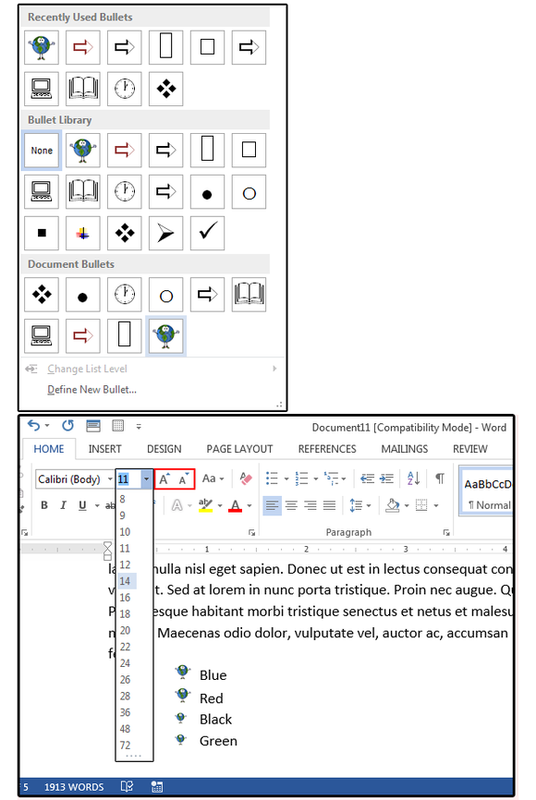 If you prefer actual fonts (other than the font you’re using in your document) instead of symbols, you can select your bullet design from the Font button. You can also change the font from the Font group, or use the Define New Bullet dialog’s Font button to change the color or attributes of your bullets. This is where the fun begins. You can actually create custom bullets from any image that exists. Because bullets are so small, detailed images may appear as dark blobs, so consider choosing simple images with minimal lines. 4. In the Define New Bullet dialog menu, click the Picture... button. 5. When the Insert Pictures dialog appears, click Browse to choose an image from your computer, or enter a search condition in the Bing Image Search field box. 6. 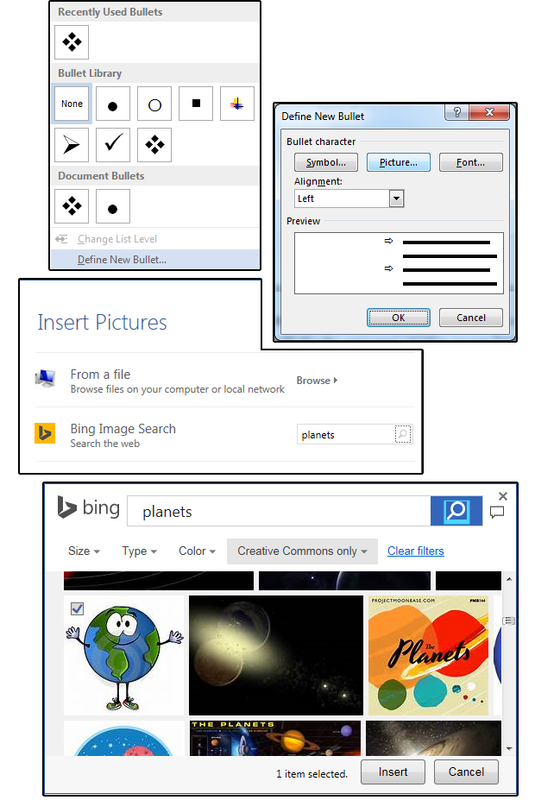 When the Bing Image window opens, scroll through the pictures, select one for your bullets, and click the Insert button. In this example, which is for a document on “green” topics, I chose a caricature of planet Earth. 7. After the first custom bullet is created, click the Bullets button again, and select the same custom bullet from the Recently Used Bullets menu list. If the bullets are too small, you can increase the font size on the bullet without affecting the font size of the following text. Highlight your custom image bullet and choose a new size from the Font group; or click the tiny up-arrow above the letter A beside the Font Size box. Here’s the fastest way: Highlight the bullet and enter the combination shortcut key Ctrl+ > (press and hold the Control key, then press the “greater than” symbol key, then release both keys). There’s a little trick here: You have to hit the Shift key before this key combination to get the “greater than” symbol. It doesn’t show in the shortcut menus, but if you don’t use the Shift key, it won’t work. Note: When an image is imported as a bullet, it’s treated like a font—as opposed to a graphic—regarding the size, so there are no sizing handles available to rescale it. You must use the font’s point size to alter the image, but notice that the other font attributes do not apply.